For me, Easter is a time of renewal and peace…and mutilation of Marshmallow Peeps. 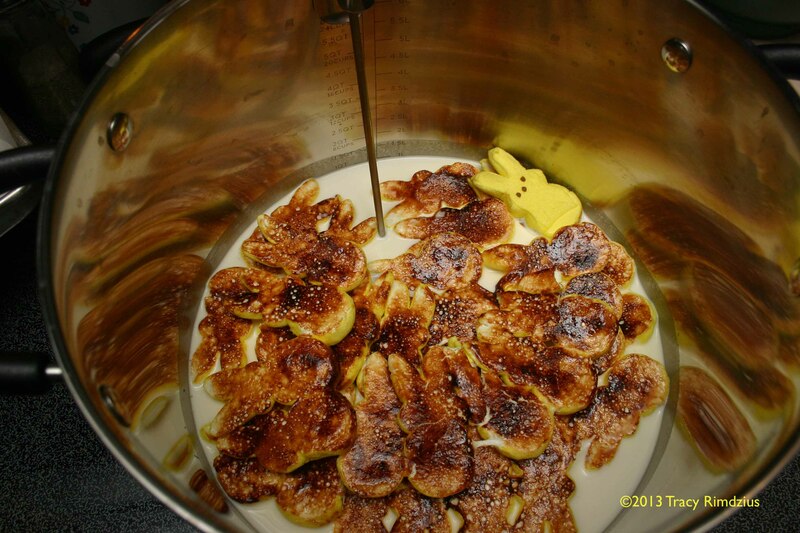 My first “stab” at ice cream recipe development was the Marshmallow Peep Ice Cream I made for Easter last year. Many Peeps lost their lives in that effort; some drowning in the boiling dairy mix, and others getting chopped into pieces for the finished ice cream. Again this year, Peeps were hurt in the making of my ice cream. I wanted to enhance the marshmallow flavor, so I decided to set them on fire toast them. I chopped the Peeps in half (more surface area for toasting!) and used a blow torch. I’m not going to lie…torching Peeps was super fun. Dave and I fought over who got to be the blow torch firing squad. I don’t believe my torture of Peeps is an early warning sign of a future in serial killing. Because Peeps aren’t real. The lone survivor and his toasted buddies about to be melted. 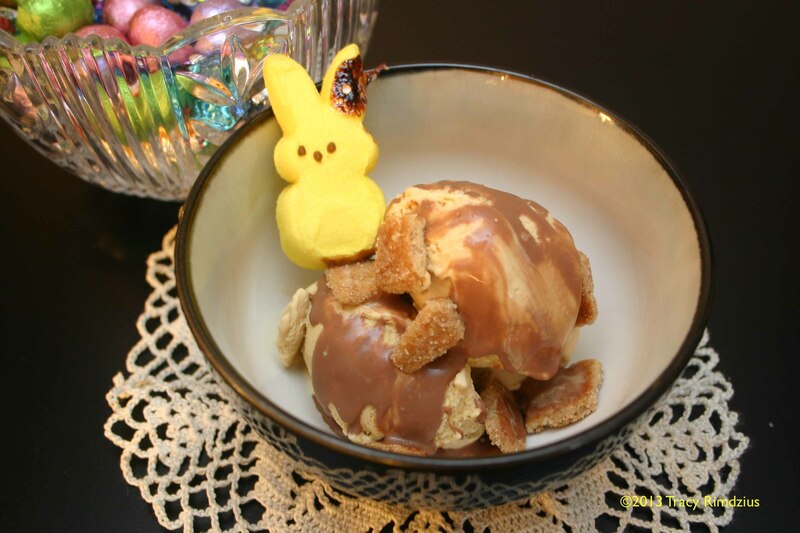 Toasted Peeps ice cream just called for a S’mores treatment, so I served the ice cream with a quick chocolate sauce and caramelized graham cracker pieces. And there you have my Easter dessert for 2013. To turn this into a Toasted Marshmallow Peep S’Mores Sundae, top the ice cream with a fluid chocolate ganache (bring 10 oz. of cream to boiling, then pour over 8 oz. of chocolate cut into small pieces in a bowl, wait 3-5 minutes and then whisk until smooth), and caramelized graham crackers (recipe here–just replace Nilla wafers with broken up pieces of graham crackers, I always use cinnamon grahams on my S’mores). Top with a toasted Peep. DELICIOUS! Although more like caramel than toasted marshmallow (I think because of the granulated sugar that coats the Peeps). ooh, interesting that the sugar caramelized that way.